Bowhead whales can live up to 211 years but there is no evidence of a bowhead ever having cancer. Scientists are trying to figure out why — with the help of Inupiat hunters on Alaska's Arctic coast. The Inupiat have hunted bowheads in the springtime from the shorefast ice north of Barrow for more than 1,000 years. In 1992, the discovery of one of their stone spearheads in a whale's blubber established for the first time just how long the whales can live. A spearhead like that hadn't been used since 1880. The whale was more than a century old. Craig George, a scientist with the North Slope Borough Department of Wildlife Management, was on the ice with the community butchering that whale when someone pointed out an ulcer in its skin. He reached into the still-soft wound and found the spearhead. Several others were found in the years that followed. George had been working with a scientist using the measurement of an amino acid in whales' eyes to find their age. The method worked to say which whales were older than others but, until finding the spearheads, there was no way to calibrate how old they were in years. The discovery that bowheads typically live 130 to 150 years put them in elite company with mammals of extreme longevity. Many of the diseases of age, including cancer, occur when the genes inside cells are damaged over time, causing unhealthy cells to be created. Considering their size, with many times more cells than a human being, whales could live so long only if they had a special ability to fix such damage. Vera Gorbunova, a biology professor at the University of Rochester in New York, cultured bowhead skin and lung cells gathered in Barrow two years ago and is trying to make them cancerous, which at first appears to be more difficult than it is with human beings. But the work is ongoing. "The biggest questions are what are the extra protections that whales have against cancer," Gorbunova said. "We would really like to understand the mechanism." Last year, a team led by scientists at the University of Liverpool in the United Kingdom published a paper in Cell Reports on the bowhead genome, primarily using biological samples from Greenland but also with support from the Inupiat whaling captains. It was already known that altering certain genes in worms or mice can slow aging and extend their lives. Joao Pedro de Magalhaes, a leader of the Liverpool team, said their bowhead study found similar changes related to cell regeneration, cancer and aging. "My own view is that this points toward improved DNA repair and cell cycle regulation mechanisms to prevent DNA damage accumulation during the life course which in turn promotes longevity and resistance to age-related diseases like cancer," Magalhaes said in an email. "But a lot more work is still necessary to prove this, for example by taking bowheads genes and studying them in cells or even in mice." Eugene Brower, president of the Barrow Whaling Captains Association, said he is happy the whalers can support research into cancer. "Any of that science is going to benefit us, and the whole world beyond," Brower said. Barrow's whalers have assisted scientists studying the North since the first expedition arrived there from the Smithsonian Institution in 1881. Often, traditional knowledge preceded scientific discovery, which only confirmed what whalers already knew. Brower said it was already clear that whales lived a long time. Hunters could see the changes in their bodies, as they grew larger and their tails more white. Whaling crews avoid the oldest whales, which can be difficult to handle because of their size and have blubber that is coarse and dry and tough when cooked. But even the oldest whales have few signs of illness, and scientists have never found a malignant tumor in a bowhead. "The whales don't get sick," Brower said, adding that illness and injuries they sustain are usually caused by humans or being caught under the ice. Magalhaes essentially agreed but pointed out that whales that die of natural causes aren't found, because they sink to the bottom of the sea. Some animals never seem to age at all, including some rockfish and turtles. Some quahog clams live more than 500 years. Bowhead may be the longest-lived mammals, although the longevity of most other whales is unknown, according to Magalhaes. "My overall take on the subject is that (as) bowhead whales age they most likely develop cancer and other degenerative diseases, but they still manage to live much longer than we do," he wrote. "They must be protected from age-related diseases when compared to humans." Turning that knowledge into therapy could be a long way off and probably wouldn't involve actual bowhead genes. But some whalers and borough officials are nervous about how the genes could be used. 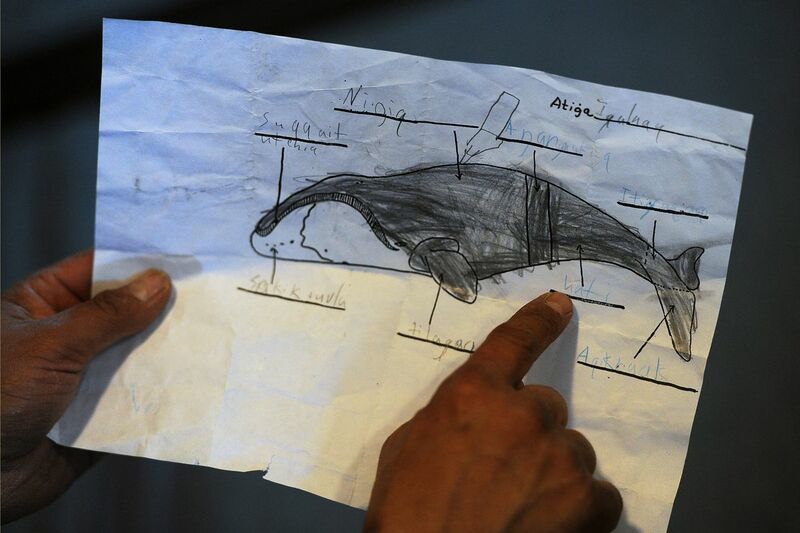 Inupiaq culture requires sharing the whale. A successful captain earns the responsibility to feed the entire village with his catch. Borough scientist George and others were bothered by the idea that medical researchers could make money from discoveries in bowhead genes. "In this brave new world of genetics, we're still working out the details," he said. "The Eskimos have made it pretty clear they don't want anybody making any money off these whales. … I'm still very leery of it until some of these things get resolved. Harvard wanted some samples, and we said no." But Magalhaes understands those concerns. His work teases basic knowledge from the whales' DNA to find out how cancer resistance works, which is likely similar to what some other animals have. "As for economic benefits, nobody owns the whale, and we have made all our data publicly available without any restrictions," he wrote in the email. "My goal is to foster research into these amazing animals and to discover ways of fighting age-related diseases." Perhaps gene science will eventually give human beings the ability to live as long as bowhead whales, with their vigor and good health. Many ethical problems would come with the transition to such a world. I think respecting the ancient ethics of the Inupiat is a good first step on that strange path.